Baldassare Forestiere’s Underground Gardens and Simon Rodia’s Watts Towers are two works of “grassroots art” that express the conflicted and often bifurcating experience of Italian immigration to America. Under a ten-acre parcel of land in rural north Fresno, California, Baldassare Forestiere (1879-1946) dug over one hundred underground tunnels and rooms where he lived throughout his life. While living in suburban Watts near Los Angeles from 1921 to 1954, Simon Rodia (1879-1965) built three towers reaching over eighty feet surrounded by numerous other forms all enclosed by a six-foot wall. He decorated his towers, forms, and walls with broken glass, pottery, shells, and other artifacts that he scavenged from the neighborhood and landscape around him in Southern California. Adjustment for Italian immigrants became a complex process that included at the same time the adaptation of Old World culture in the new land and assimilation into New World society.1 But recollections of the past and settlement in the New World were not often easily reconcilable for the immigrant or even later generations.2 Together, the iconography of Rodia’s towers and Forestiere’s grottoes expresses the tension between hope and memory that is central to the bicultural, immigrant experience. 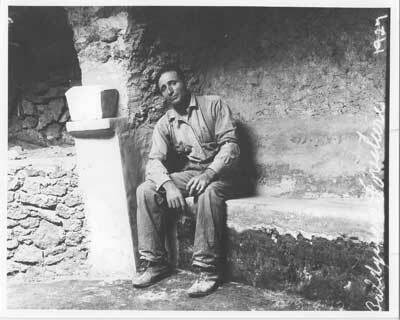 As Jerre Mangione wrote about his relatives in Mount Allegro, they liked to tell stories about Italy, “a past they had long ago romanticized,” in spite of the poverty they left behind.3 Forestiere’s life and Underground Gardens articulate in their form the conflict between the past and present, while Rodia’s life and his Watts Towers more successfully merge that past with his hope for a better life in Southern California. Neither the Underground Gardens nor the Watts Towers can be fully appreciated without an understanding of the heritage, geography, and communities that influenced the lives of Baldassare Forestiere and Simon Rodia.